Good beer is a terrible thing to waste. Unfortunately, the partial government shutdown is leaving some breweries with no choice. The federal agency responsible for approving beer can labels, the Alcohol and Tobacco Tax and Trade Bureau (TTB, for short), isn’t reviewing submissions at this time and breweries across the country are unable to release new beers. Without proper labels, which include information about the alcohol content and the surgeon general’s warning, canned and bottled beers -- often a big part of small craft breweries’ business -- are unsellable. City Barrel Brewing, located in Kansas City, Missouri, is making lemonade out of the lemons the shutdown’s handed them, though. “The regulating body that we have to submit all of our labels to, to get approved by is shut down,” James Stutsman, who owns the brewery, told KCUR. “A big part of our portfolio is canned beer to go. Because there’s nothing more beautiful than this,” he added, mimicking the sound of a beer can opening. The TTB typically takes about three weeks to approve labels submitted by breweries, but during the shutdown, their website says, “submissions will not be reviewed or approved until appropriations are enacted.” The agency intends to tackle the backlog “once funding has been restored and the government shutdown is over,” but there’s a chance that by then, hundreds of gallons of beer will have reached and passed its peak freshness and no one wants to pay for stale beer. Instead of letting the hoppy liquid gold go to waste, Stutsman’s decided to give it away. “I can’t sell it. I can’t package it, so we’re just going to give it away for free,” he said. This revolutionary act comes at a price to Stutsman’s business, though. By giving the beer to revellers for free, he’s pouring out about $3,000 to $4,000, which is far from pocket change. City Barrel Brewing isn’t the only beer company feeling the effects. Fred Maier, of Susquehanna Brewing Company, recently revealed that the company is also suffering. It had planned to release several seasonal beers for spring, but those plans are on hold during the shutdown. While many breweries were able to get their new labels in before the shutdown, those that either didn’t have that foresight or simply didn’t have labels to submit prior are experiencing similar issues. Naturally, brewers aren’t happy. 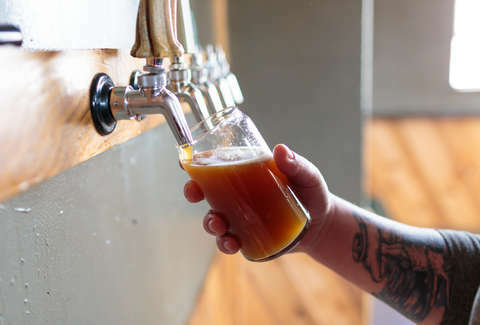 Consumers may not be feeling the effects of the shutdown yet, but as fallout extends to more breweries, bars, resellers and distributors, getting your hands on your favorite hoppy elixir could prove difficult without going directly to the source for draught pints. In the meantime, pour one out for all the beers that may never make it to market.